The year was 1987. It was Super Bowl Sunday and I was getting ready to cheer on my beloved Denver Broncos as they faced the New York Giants. My mother made halibut for dinner, which was noteworthy because she never cooked fish. Having no prior experience to fish, I ate it. I can still taste the strong fishy flavor--combined with the bitter taste of a 39-20 loss, mixed with the salt of my six-year-old tears--on my tongue. In the years since, I have avoided fish almost entirely. Until last week. Much like yoga, I've always thought I should give sushi a try. But I've never been motivated enough to say, "Hey Traci, let's go get some sushi tonight." (Or say, "Let's go to sushi." Why do people "go to" sushi? I'm going to start saying, "Hey, let's go to pasta" or "Let's go to hamburgers.") And Traci would never agree to sushi anyway. But I have some other friends who can't get enough of the uncooked stuff. So I tagged along. 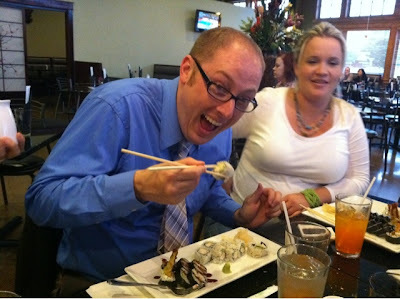 My first sushi experience started off well enough. I was having a great time at the restaurant, chatting it up, and drinking my orange Fanta. And the something happened. "What's that fishy smell in here?" I thought. It was, of course, our meal. I started off cautiously with the California roll. Then I moved on to the Spider roll...and then to the Prozac roll...and then the Xanax roll...and then to all of the other ultra-cool-pharmaceutically-named rolls. I dipped stuff in eel sauce and wasabi sauce and whatever else. And soon I realized I'd already downed like 10 of the things. Did I like it? No, not really. But I figured if I was going to try it, I better try it. And now I have two memories of fish: the first of three Denver Broncos Super Bowl defeats (which was bad), followed by two Denver Bronco victories (which was good); and a meal that made me a little sick (which was bad), but was accompanied by some delicious orange Fanta and some dear homies (which were both good). Only four months 'til my birthday lunch at the Chuck a Rama.